I recently had the opportunity to be Phil and Angie’s Panama City engagement photographer at Camp Helen State Park on the West End of Panama City Beach. I have known Phil for a while now and I can honestly say he is one of the most genuine people you will ever meet. There is a thoughtful, gentle kindness about him that sets him apart from the crowd. You would not expect that from a drummer (everyone knows how crazy drummers are), but is is true. Obviously, Angie must see these traits as well because she has decided to spend the rest of her life with him. Speaking of Angie…what a sweetheart! She was gracious and up for doing what it took to get the photograph just right. Thanks for that, Angie. You should have seen them as they came strolling across the beach with their matching bicycles. It was a really cute sight. I love when couples match. My wife hates when I match what she is wearing for the day. I get a big kick out of it because on one hand it is super cheesy, but also kind of sweet at the same time. I think it shows a bond and a closeness when you are confident enough to be seen in matching attire. Seeing Phil and Angie with their matching bikes was not cheesy, though. It was just plain cool. 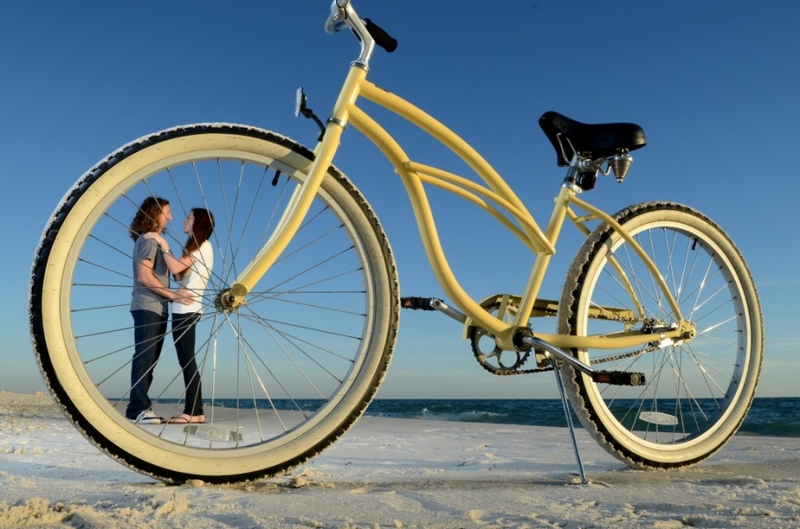 The bikes were as cool as the couple and putting it all together really made for some nice photographs. 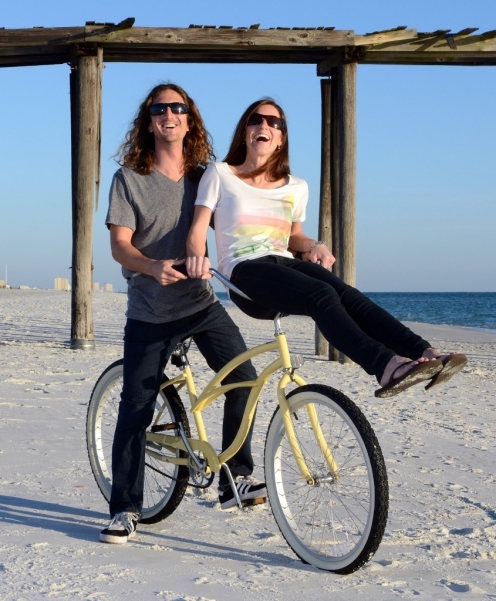 We got a few photographs with the bikes and then moved down the beach a little to get some sunset photos. I was a little scared that the sunset was not going to majestic, but it turned out to be beautiful. When I showed Phil a preview of one of the photos he said it looked like a volcano was erupting in the background. Yeah….I planned that. Congrats to Phil and Angie. I know you are going to have a beautiful life together!